The Soluxio solar light post is the most cost-efficient and environmentally friendly solution in areas where no power grid or other lighting infrastructure is present, or where replacement is due. With an efficiency of over 23%, the Soluxio’s solar panels are the most efficient on the market. Sunlight always reaches the photovoltaic cells at an optimum angle due to the solar panels’ cylindrical shape. All generated energy is stored in a high capacity lithium battery. Even in case of cloudy weather or during a complete absence of sunshine, the lithium battery can power the solar light post up to several weeks on end. Advanced wireless communication hardware combined with an online monitoring platform enables full remote management. In addition to brightening up public places and modernising any street with its state-of-the-art design, the advanced wireless connectivity extensions of the Soluxio solar light post make it the perfect platform for smart city applications. The solar light post can be tailored to fit your specific requirements. Key parameters (such as mast height, luminaire type, number of solar modules and battery capacity) can be optimised and adapted to the configuration of any location and application. Because of this modularity, the Soluxio solar light post amounts to so much more than just a solar street light. Its design allows for easy implementation of additional functions such as WiFi hotspots, USB charging points, cameras or various sensors. No cabling means quick and simple installation. With the Soluxio, invasive and expensive trenching is a thing of the past. Autonomy means reliability. The Soluxio is insensitive to blackouts, making it the best option in unpredictable circumstances. A remote management platform lowers operational cost. Maintenance can be better predicted and scheduled. With its capacity for advanced connectivity, the Soluxio solar light post is part of the Internet of Things. Because every light post has its own SIM card, the Soluxio can communicate wirelessly over the internet. By integrating a WiFi hotspot, the connection can be shared with other devices. This creates a local network with endless possibilities. A Soluxio solar light post uses its integrated GPS receiver to tell exactly where it is and what time it is. This means it can automatically adapt to the seasons and local weather conditions. All of the solar powered light posts are connected to an exclusive, secure online platform, to which they transmit their status automatically. You can monitor all system parameters through a straightforward visual interface. 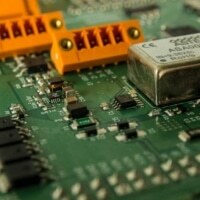 Failures or defects are automatically detected and reported, reducing maintenance costs while increasing reliability. Managing your lighting remotely or viewing historical data is easy and can be done from any location, allowing for full optimisation of both lighting and maintenance schemes. The Soluxio is the perfect smart city platform. The modular design allows for the integration of additional features like a surveillance camera, weather station or pedestrian sensor. All applications can be installed easily through the hatch on ground level. This way, the Soluxio solar light post can be made even smarter. By measuring traffic streams or local air quality, the Soluxio can help to increase safety and quality of life in your city. 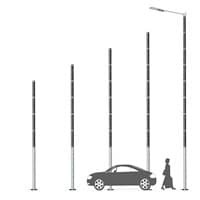 Combining multiple functionalities in a single pole makes the Soluxio a cost-effective way to sense your city. 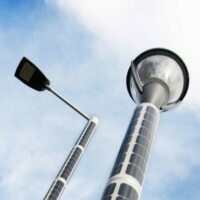 The Soluxio solar light post is more than just a solar-powered street light. Its sleek design fits perfectly in modern urban areas and green environments where sustainability and energy savings are valuable. But the solar light post is also made to withstand the roughest conditions. In areas where no (reliable) electricity grid is available, the Soluxio is the solution. Think of inaccessible areas like mountainous regions or islands, or locations where earthworks are a problem like parks, resorts or dykes. Furthermore, in applications where reliability is key and efficiency is important, the Soluxio is the product of choice. Because every light post functions independently and off-grid, blackouts due to power failure cannot occur. This autonomy makes the Soluxio solar light post suitable for use in temporary settlements or mobile applications such as military bases or refugee camps. The Soluxio solar light post is also offered as an OEM platform to which you can add your own technology. The light post therefore serves as a mobile solar-powered platform which can support a wide range of applications. For example, the pole can be used as a solar powered antenna, as a radio tower for mobile applications or even a charging station for mobile devices. Developed with world leading partners, the Soluxio features the best solution in all minor details. Designed, manufactured and assembled entirely in the Netherlands means that only the highest quality is delivered conform European standards. 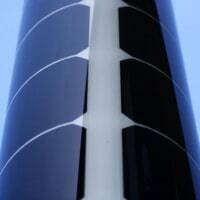 The Soluxio features unique patented cylindrical solar modules. Our solar cells have the highest efficiency in the market (>23%) and continue to perform excellently at higher temperatures. Similar to conventional solar panels, the cells are directly laminated onto their scratch resistant exteriors. This increases both performance and durability, and ensures no dirt or moist can accumulate in between the cells and the casing. 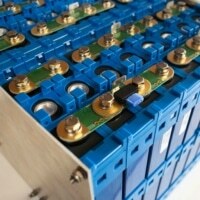 The lithium batteries used in the Soluxio have many advantages over other battery technologies. Low and high temperature performance and tolerance to deep discharging are superior. The lifetime of lithium batteries (8-10 years) is significantly longer than for example lead batteries (2 years); during which no maintenance is required. Advanced electronics maximise the power output of every individual solar module. All solar cell strings (vertical rows) function independent from each other, so that a single point of failure will not affect the rest of the system. This means that a damaged solar panel will not affect the performance of the other panels, ensuring reliable operation even during the harshest of conditions. 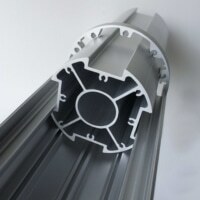 Clever aluminium profiles are the backbone to the Soluxio’s modularity. Made of recycled marine grade 6060 T66 aluminium alloy (which can be colour anodised or powder coated to suit any environment) the Soluxio solar light post will retain its smooth finish throughout its entire lifetime. The Soluxio’s modular design allows you to adjust the light pole to your specific application. Based on a project’s precise requirements and geographical location, the Soluxio solar light post is tailored to your needs. By optimising all key system parameters such as battery capacity and number of solar modules, reliable operation at the lowest possible cost is ensured. But adapted functionality isn’t all that we offer. Different colours, finishes and luminaire designs will make the solar light posts fit in every possible environment. Mast height can be varied from 3 meters to 12 meters to achieve the optimum luminaire height. Based on the required energy usage and geographical location, the number of solar modules can be varied accordingly. Mast color and finish can be customised to your demand. Anodising or powder coating in various colours is possible. The solar modules are available in black and white, with custom colours possible on request for larger projects. Various luminaire types with a range of wattages can be fitted onto the Soluxio, so that a suitable solution for every location can be found. The Soluxio’s specially developed LED driver can be fitted to a third party luminaire of your choice. We also offer our own line of luminaires. Battery capacity can be scaled to fit luminaire wattage, lighting scheme and geographical location. This ensures the Soluxio will reliably operate all year round. By default, lithium batteries are integrated in the mast. 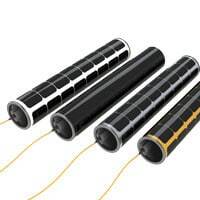 If desired, an external underground battery pack or different battery type can be supplied. Various foundation types can be used to anchor the Soluxio in the ground. We offer a special ground screw for extremely quick and easy installation without digging, with the possibility to easily (re)move the pole again if needed. 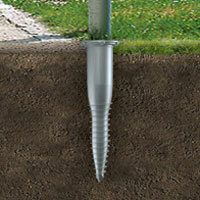 Depending on the local soil, placing the column directly in the ground or on a concrete foundation is also possible. In the table below, you can find the most important technical specifications and features of the Soluxio. The Soluxio is optimised for use of LED lighting systems and can be used with several LED luminaire brands. Compatible with all Philips solar drivers and most other drivers. AC power control optional but not recommended. We offer our own LED driver specifically designed for the Soluxio. The luminaire can be dimmed according to a predefined lighting scheme or by input from a motion sensor. The Soluxio can be fitted with multiple luminaire bracket types. For more details and an overview of the certifications that the Soluxio complies with, please visit our Downloads section. Are you interested in the Soluxio or would you like to know more about it? Please send us your request in the form and we will contact you as soon as possible.